Good day... at about 9am Galapagos time, I arrived by boat to Santa Cruz Island. Along the way, I passed a small island called Santa Fe Island which I believe has no inhabitants. Once on Santa Cruz, I found the bed and breakfast that was reserved called, Captain Max. I am convinced that the weather on Santa Cruz is hotter than the last island. You know, when Darwin came to visit the Galapagos in 1835 during Sept and Oct, it would have been during the dry season. No wonder he called this place hell on Earth... because of the heat, harsh landscape, and odd creatures. Evolutionary wise, it's a naturalist's paradise, but I wouldn't necessarily consider it a luxury vacation spot. I will say that the people again have been very hospitable, sadly many seem to be concerned about the alleged corrupt government, the years of recession, and freedoms that we take for granted in the USA. They are a very very proud people, but living on the Galapagos seems to be as much as a challenge as surviving as an animal or plant on these islands. Well, after checking into the bed and breakfast, I went immediately to the Darwin Research Center only a few miles away. At the center they invite scientists from around the world to help maintain animal and plant life on the Galapagos by using captive breeding methods, genetic research, and various conservation methods. At the research center (est. 1959), the two major attractions were the Galapagos Tortoises (saddle-back (smaller) and dome (larger ~500 lbs) as well as the land iguanas. The idea is to help restock the wild population. These slow moving animals were easy prey for pirates and colonists who used them for food and money which led to a decline in the late 1970's. Even Darwin's ship took on the animals for food; however, Darwin didn't think about saving any shells prior to them being tossed overboard after the animal meat was eaten. 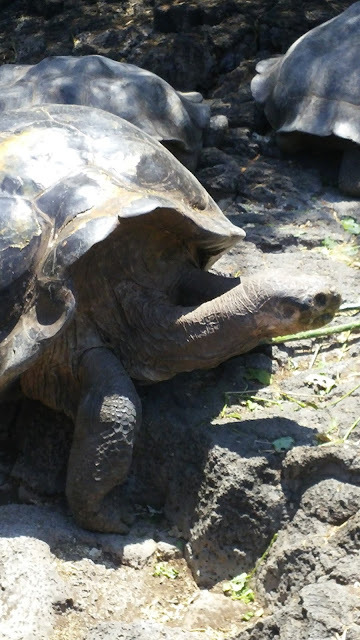 Many of the tortoises are now hybrids from other species from other islands. This was because in the earlier days of the center, all tortoises (m/f) were put into the same area. Many of these animals came to the center as once pets from the local people. The government ordered that all tortoise pets were to be given to the center. As a result the tortoises are hybrids of various species. Having learned the mistake, researchers are trying to now isolate the animals to regain some level of original speciation. 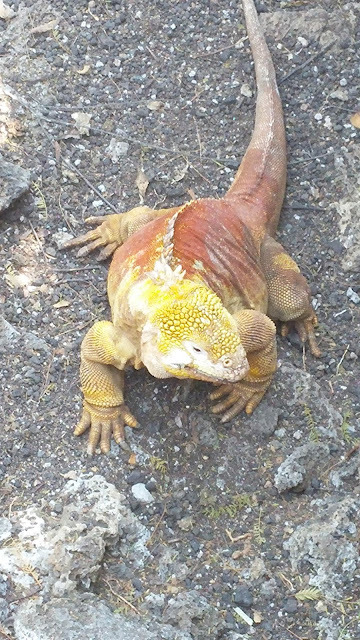 The center also housed a yellow land iguana (2 males and 1 female) to help with their breeding program. The Galapagos has also the Santa Fe (tanish) and a newly found... Pink iguana found on Isabela (northern part). Genetic evidence seems to prove that the original iguana that came to the islands millions of years ago may have first branched into the Pink which may have have been able to skip from the older islands like San Cristobal to end up on an island that is one of the newest. The pink hue may have been caused by choice in diet. Update: Went to a nice restaurant and then did take a walk along the pier. It was true about seeing rays and sharks. The rays swam in schools around the pier and I did see about 3-4 medium size sharks. I also went to a small fish market. Fishermen would bring their catch to the pier where people would prepare them for market. Curiously, the "garbage disposals" were pelicans and sea lions that would wait for any table scraps that the butchers would throw to the grown - quite efficient method of clean-up I would say. 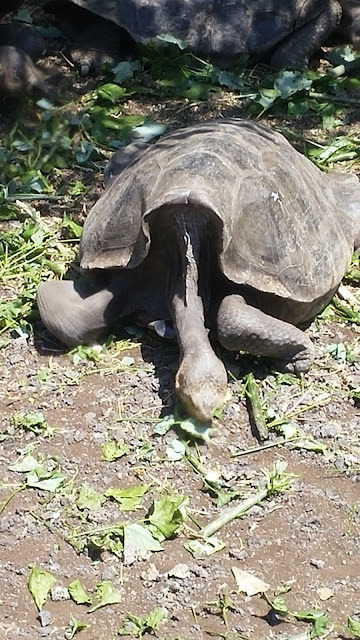 "The notch is meant for the animal to research high vegetation - an evolutionary advantage if you live in the dry lowlands of certain Galapagos islands with high vegetation (ie Prickly Pear)"
With my favorite type of land tortoises, the "saddleback"
"Again, an evolutionary advantage if you live on islands with low vegetation"
Black-tipped sharks probably attracted to the fish from the fish market around the pier at night. Natural selection even at the fish market, watch what happens to the poor seal's dinner when the butcher throws the scraps to the floor. The seals (and birds) looked like house pets begging for food at the dinner table.